Former UK ambassador to Afghanistan calls for legalisation of drugs. Sir William Patey acknowledges west’s failure to eradicate poppy crops in Afghanistan as he calls for state-regulated drug trade. 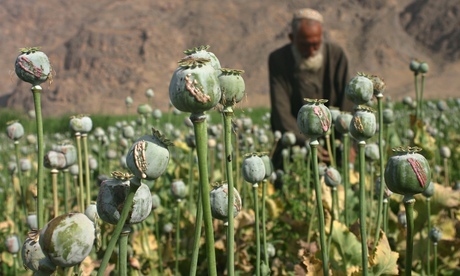 Afghanistan is estimated to have produced almost £1.7bn worth of opium and its derivatives heroin and morphine in 2013. The former UK ambassador to Afghanistan, Sir William Patey, has come out in favour of legalising drugs after acknowledging the failure of British-led efforts over the last 10 years to eradicate poppy crops in the country. Patey, one of the most experienced diplomats of his generation, with a string of postings that include Iraq, Sudan and Saudi Arabia, becomes one of the highest-profile figures in Britain to back legalising and regulating drugs. His comments run counter to Home Office policy and will be rejected outright by many drug policy groups. While the legalisation of cannabis is growing fast in the US and elsewhere, there is little support worldwide for similar action on opium. Patey’s call for legalising production and supply is backed by one of the leading groups calling for reform, Transform Drug Policy Foundation. Patey’s transformation is similar to that of another former British diplomat, Sir Keith Morris, who saw the drug wars at first-hand in the 1990s while ambassador to Colombia. In 2001, he had an article published in the Guardian describing the drug war as unwinnable and calling for legalisation. Calls for legalisation have also been made by senior police officers and a scattering of politicians. Afghanistan, based on UN figures, is estimated to have produced almost £1.7bn worth of opium and its derivatives heroin and morphine in 2013. Patey, in an interview with the Guardian, said he had not held strong opinions on drug policy before taking up his post in Afghanistan in 2010 and if he had thought much about it, his views would probably have been orthodox. It was only as he was leaving Afghanistan in 2012, reflecting on successes and failures, that he acknowledged that the 10-year-old effort to stem the flow of heroin had failed. “We devoted all the resources we could. When we leave this year, poppy production will be the same – or higher – than when we seriously started trying a decade ago,” he said. Transform picked up on remarks Patey made at the time of his departure and got in contact. “They persuaded me without too much trouble that there was a better way,” he said.